Offers comfortable glamping bed and breakfast accommodation on a working cherry farm, situated in the picturesque village of Offham in Kent. 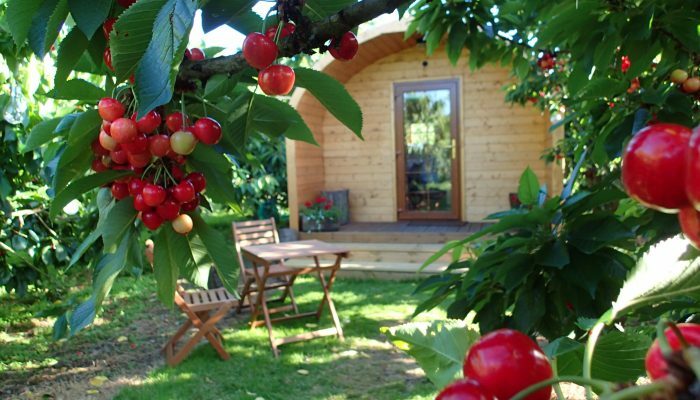 Our 2 luxury wooden pods are tucked amongst the cherry trees, so that you can enjoy the peace of the orchard with its views of the North Downs, whether you are searching for a romantic weekend getaway, a short break or an action packed trip exploring the local area. Dogs are welcome, there are plenty of walks and dog friendly pubs on our doorstep. Each pod has an ensuite bathroom and is fully furnished for 2, double bed, towels, cutlery, crockery, utensils etc, it has a fridge with ice compartment, microwave, 2 ring hob, kettle and toaster, tea, coffee and milk. Indoor and outdoor seating, a TV in case it is wet and you don’t want to go anywhere! Continental breakfast for 2 is included – orange juice, bread, jam, marmalade, cereal, seasonal fruit, yogurt and eggs, you can cook these in your pod, plenty of pans for frying, scrambling or boiling or take them away.